Heat oven to 425°F. Place pie crust in 9-inch glass pie pan as directed on box for One-Crust Filled Pie. Bake 5 to 7 minutes or just until edge begins to brown. If crust puffs up in center, gently push down with back of wooden spoon. Meanwhile, in large bowl, combine cheese and flour; toss to coat. Add bell pepper and onion stir-fry and mushrooms; toss to mix. Remove partially baked crust from oven; reduce oven temperature to 375°F. 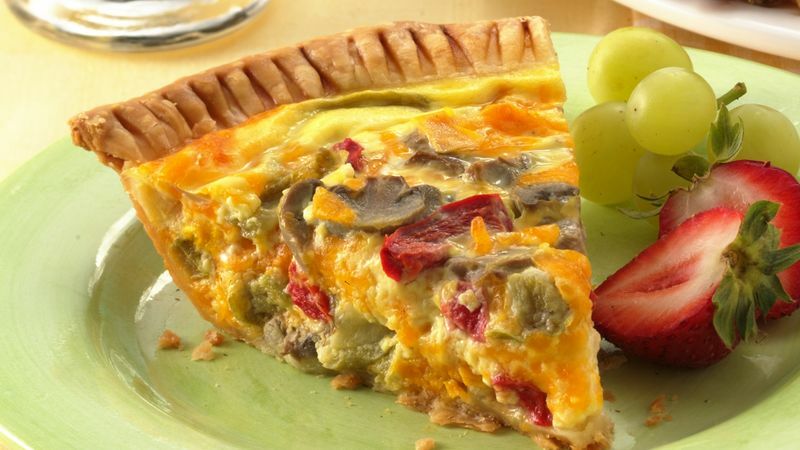 Spoon cheese mixture into partially baked crust. In same bowl, combine all remaining ingredients; beat until well blended. Pour over cheese mixture. Return to oven; bake at 375°F 35 to 45 minutes longer or until filling is puffed and knife inserted in center comes out clean. If necessary, cover edge of crust with strips of foil during last 15 to 20 minutes of baking to prevent excessive browning. Let stand 5 to 10 minutes before serving. *Prebaking the crust a few minutes helps eliminate a soggy crust.